We currently operate a minimum of two nights stay. Prices listed are per person, per night based on two people sharing a room inclusive of Breakfast. If You cancel Your Booking more than 48 hours before the scheduled check-in time on the date of arrival, no charge will be made. If You cancel Your Booking within 48 hours of the scheduled check-in time on the date of arrival, a charge equivalent to the total Booking price will be levied. Leave the motorway at Junction 23, follow A39 West signposted BRIDGWATER. Stay on A39 through BRIDGWATER following signs to MINEHEAD. Remain on A39 for approximately 20 miles until the village of CARHAMPTON* - watch for turning on the right on entering the village at bottom of hill. Follow Blue Anchor road for approximately 1 mile over hill and into village, pass Blue Anchor Bay Garage on right hand side then approximately 200 yards, The Langbury is on the right hand side. Leave the motorway at Junction 25. Through TAUNTON on A358. Continue on A358 signposted Minehead for approximately 15 miles to WILLITON. Join A39 signposted MINEHEAD, thence to CARHAMPTON* and see above. From West - if approaching CARHAMPTON on A39 from WEST the BLUE ANCHOR turning is on the left hand side at the far end of the village. 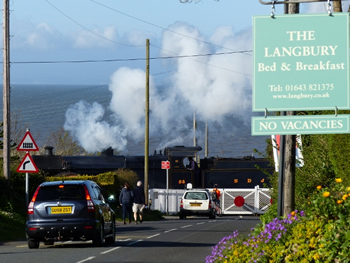 *you may see signs for Blue Anchor at other locations en route - ignore these as they all proceed via Watchet. This is an awkward approach due to our steep drive.